SUSSEX, Wis.--(BUSINESS WIRE)--Quad/Graphics (NYSE: QUAD) (“Quad”), a leading marketing solutions provider, announced today that it has increased its equity position in Rise Interactive (“Rise”), acquiring a majority ownership stake in the award-winning digital marketing agency. Quad/Graphics has owned a non-controlling interest in Rise since July 2016. The investment accelerates Quad’s ongoing transformation to leverage its strong print foundation as part of a much larger integrated marketing platform that addresses clients’ increasing need to reduce complexity and improve process efficiencies and marketing spend effectiveness. This industry-differentiating platform allows Quad to fulfill traditional agency functions, such as data and media strategy, while also providing integrated marketing execution across multiple channels – both online and offline. This press release contains certain "forward-looking statements" within the meaning of the Private Securities Litigation Reform Act of 1995. Forward-looking statements include statements regarding, among other things, our current expectations about the Company's future results, financial condition, revenue, earnings, free cash flow, margins, objectives, goals, strategies, beliefs, intentions, plans, estimates, prospects, projections and outlook of the Company and can generally be identified by the use of words or phrases such as "may," "will," "expect," "intend," "estimate," "anticipate," "plan," "foresee," "project," "believe," "continue" or the negatives of these terms, variations on them and other similar expressions. These forward-looking statements involve known and unknown risks, uncertainties and other factors which may cause actual results to be materially different from those expressed in or implied by such forward-looking statements. Forward-looking statements are based largely on the Company's expectations and judgments and are subject to a number of risks and uncertainties, many of which are unforeseeable and beyond our control. The factors that could cause actual results to materially differ include, among others: the impact of decreasing demand for printed materials and significant overcapacity in the highly competitive commercial printing industry creates downward pricing pressures and potential underutilization of assets; the impact of electronic media and similar technological changes, including digital substitution by consumers; the inability of the Company to reduce costs and improve operating efficiency rapidly enough to meet market conditions; the impact of changing future economic conditions; the failure of clients to perform under contracts or to renew contracts with clients on favorable terms or at all; the impact of increased business complexity as a result of the Company's transformation into a marketing solutions provider; the impact of regulatory matters and legislative developments or changes in laws, including changes in cyber-security, privacy and environmental laws; the impact of fluctuations in costs (including labor and labor-related costs, energy costs, freight rates and raw materials) and the impact of fluctuations in the availability of raw materials; the failure to attract and retain qualified production personnel; the impact of changes in postal rates, service levels or regulations; the fragility and decline in overall distribution channels, including newspaper distribution channels; the failure to successfully identify, manage, complete and integrate acquisitions and investments; the impact of risks associated with the operations outside of the United States, including costs incurred or reputational damage suffered due to improper conduct of its employees, contractors or agents; significant capital expenditures may be needed to maintain the Company's platform and processes and to remain technologically and economically competitive; the impact of the various restrictive covenants in the Company's debt facilities on the Company's ability to operate its business; the impact on the holders of Quad/Graphics class A common stock of a limited active market for such shares and the inability to independently elect directors or control decisions due to the voting power of the class B common stock; the impact of an other than temporary decline in operating results and enterprise value that could lead to non-cash impairment charges due to the impairment of property, plant and equipment and other intangible assets; and the other risk factors identified in the Company's most recent Annual Report on Form 10-K, as such may be amended or supplemented by subsequent Quarterly Reports on Form 10-Q or other reports filed with the Securities and Exchange Commission. Except to the extent required by the federal securities laws, the Company undertakes no obligation to publicly update or revise any forward-looking statements, whether as a result of new information, future events or otherwise. Quad/Graphics (NYSE:QUAD) is a leading marketing solutions provider. The Company leverages its strong print foundation as part of a much larger, robust integrated marketing platform that helps marketers and content creators improve the efficiency and effectiveness of their marketing spend across offline and online media channels. With a consultative approach, worldwide capabilities, leading-edge technology and single-source simplicity, Quad has the resources and knowledge to help a wide variety of clients in multiple vertical industries, including retail, publishing and healthcare. Quad provides a diverse range of digital and print and related products, services and solutions from multiple locations throughout North America, South America and Europe, and strategic partnerships in Asia and other parts of the world. For additional information visit www.QG.com. 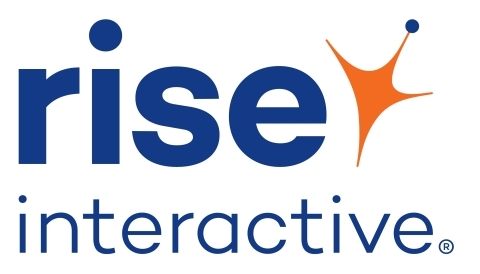 Rise Interactive is a digital marketing agency specializing in media, analytics and customer experience. The agency’s proprietary Interactive Investment Management® approach uniquely helps clients see, shape and act on opportunities across the entire digital landscape. Rise is a strategic partner, helping leading brands like ULTA Beauty, Atkins Nutritionals and others make smarter marketing investment decisions and create more relevant experiences for their customers. For more information, visit www.riseinteractive.com or follow the company on Twitter @riseinteractive. Quad/Graphics announced today it has increased its equity position in Rise Interactive acquiring a majority ownership stake in the agency.